Actor Paul Lazar channels artist Suzanne Bocanegra in a unique work that’s part artist’s talk, part performance, part cultural history, and part sound installation. Together (in a way) they tell the story of a priest, an artist, and a young girl in Pasadena, Texas—a story featuring Elvis, abstract expressionism, the Pope, astronauts, the Singing Nun, and, obviously, a witch. 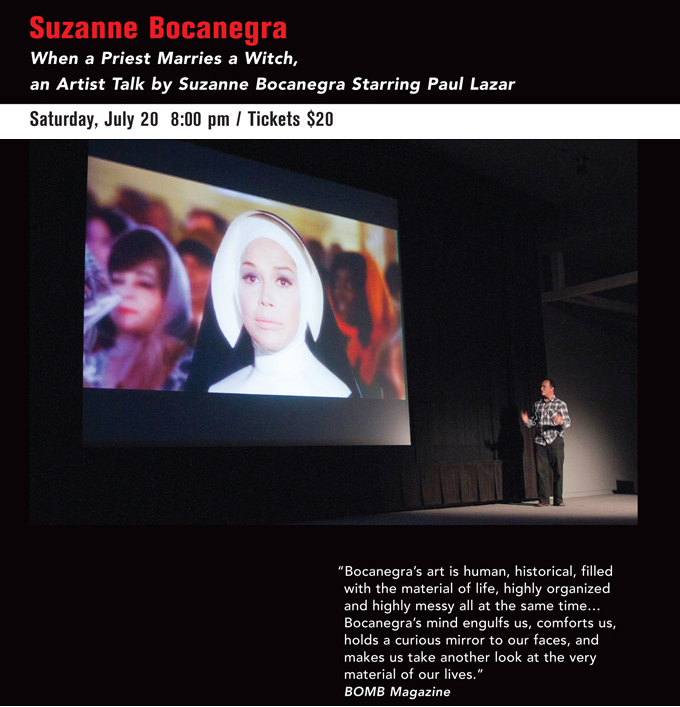 Suzanne Bocanegra is a New York-based visual artist whose recent work involves large-scale performance and installation. She is a recipient of the Rome Prize and has received grants from the National Endowment for the Arts, the New York Foundation for the Arts, and elsewhere. Paul Lazar co-founded Big Dance Theater with Annie-B Parson in 1990 and has created dance/theater works with the company ever since. He is an Associate Member of The Wooster Group and has acted in over 30 feature films. He currently teaches at New York University.